VR (Variable Resistor atau tegangan analog pwm arduino 0-5V yang mewakili 10% hingga 100% kecepatan motor). ZF (pin direction motor, logika high untuk CW, logika low untuk CCW). M (tachometer pulse output, jumlah pulsa output bergantung jumlah kutub motor dan pulse per revolusinya). EL (pin enable, logika high untuk Run, logika low untuk Stop). 1) Control TTL voltage means the High voltage of the control pins (EN, LPWM, RPWM, DIS). 2) The stable max working current is 20A while load Vcc is between 12V~30V. The current is restricted by heat dissipation. Current, we don’t add any heat radiator on the board. So if the current is over 20A, the heat may melt the soldering tin and cause problems. If you want it working stable at higher current, you should add radiator. 3) Power Vcc is recommended to be higher than 12V if your load is large-current devices. While over 12V, the MOSFET is working fully and its power consumption is small. So the heat will be less. If your load current is not large and just several amperes, the power Vcc can be as low as 3V. 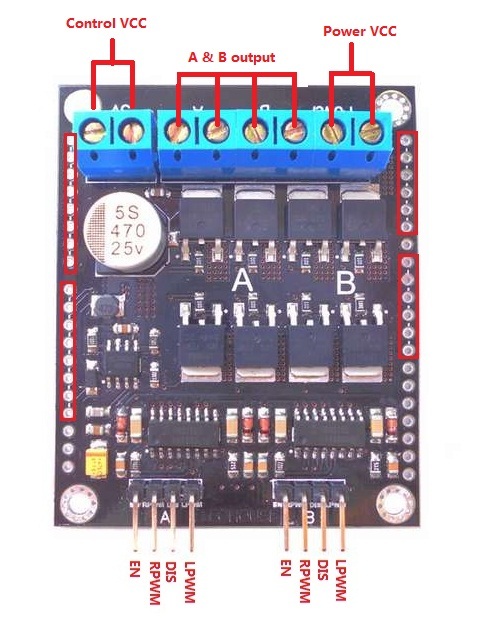 We are trying to let this driver be compatible with Arduino and non-Arduino users. We leave holes on the PCB and so mount long-pin felmale hearders to plug in Arduino. If you are non-Arduino user, leave the holes alone. To improve performance while with large current load. you could add soldering tin on the routs shown below. Basically the control is very easy. 1. Smaller PWM duty will get higher speed. 2. PWM frequency should be 1Khz ~ 60Khz. Smaller frequency could get it work but not in perfect performace. It may increase the module’s resonse time, but very slight in nanosecond level. We can’t sense it. 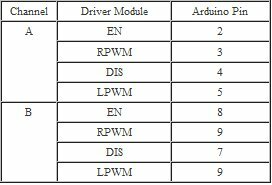 Default frequency of Arduino PWM is 0.5Khz. In our test, the default frequency could get it work very well. But remember, for better performance, the recommended frequency is 1Khz ~ 60Khz. In our library, we set the pwm frequency over 1Khz. Note : GND mikrokontroller harus tersambung dengan GND driver motor ini.